Recent advances in synthesizing valuable chemicals such as organic acids from low-cost renewable biomass through microbial fermentation have attracted great attention. However, the toxicity of organic acids presents a key challenge to the development of an economically viable fermentation process. Therefore, a platform organism that not only produces organic acids but also tolerates the associated toxicity is highly desirable. Here we report the discovery, characterization, and engineering of a yeast strain, Issatchenkia orientalis SD108, that is tolerant to low pH and high concentration of organic acids. This strain demonstrated a higher tolerance compared to I. orientalis ATCC 24210 and Classic Distiller’s Turbo yeast. In order to explore SD108 as a potential platform organism for organic acid production, we determined its draft genome sequence and use the sequencing information to guide pathway design. As proof of concept, an engineered four-gene expression cassette related to the reductive TCA cycle was assembled and integrated into the genome of a uracil auxotroph of SD108. The resulting strain was able to produce succinic acid with a titer of 11.63 g/L, yield of 0.12 g/g, and productivity of 0.11 g/L . h in batch cultures using shake flasks. The high tolerance of I. orientalis SD108 towards multiple important organic acids makes it a highly attractive organism as a platform host for producing this group of compounds as it will reduce production cost, facilitate downstream processing, and serve as a host for construction of production strains with both pH and specific anion tolerance. Largely owing to the concerns with sustainability, global climate change, and energy security, the use of microorganisms to convert renewable biomass to fuels and chemicals has become increasingly attractive. In 2004, the US Department of Energy (DOE) described twelve platform chemicals that could be produced from renewable biomass in a biorefinery, eight of which were organic acids . The wide application of organic acids as platform chemicals, alongside the relatively few enzymatic steps required for their production, has led to intensive investigation into their microbial synthesis. One example is succinic acid, which is a precursor of many industrially important chemicals such as 1,4-butanediol, tetrahydrofuran, −-butyrolactone and various pyrrolidinone derivatives . Other organic acids of interest include itaconic acid, adipic acid and acetic acid. The major applications of itaconic acid include the use as a copolymer with acrylic acid and the conversion to many commodity and specialty chemicals including pyrrolidones and 2-methyl-1,4-butanediol . Although they are not among the twelve platform chemicals, adipic acid is a key C6 dicarboxylic acid ingredient in the production of nylon 6,6 and thermoplastic polyurethanes, and has an annual market of $6.3 billion , whereas acetic acid is one of the common inhibitors present in lignocellulose hydrolysates, which can lead to severe growth inhibition even at low concentrations . For an economically viable process, a platform organism that not only produces a high level of target organic acid but also tolerates the associated toxicity is highly desired . Recently, we isolated a yeast strain, named as SD108, and identified it as Issatchenkia orientalis by DNA sequencing of its 26S ribosomal RNA genes. Due to its ability to grow at low pH, I. orientalis has been used in ethanol fermentation at pH 2  and could grow on the saccharification products hydrolyzed from lignocellulosic biomass by sulfuric acid . Cargill Inc. (Wayzata, MN) also used I. orientalis for lactic acid production in unbuffered cultures and obtained production rates and yields similar to those of traditional bacterial lactic acid processes . With its potential as a platform organism to produce organic acids, further investigation of this organism is needed. In this study, we provide a biochemical characterization of I. orientalis SD108 and demonstrate that this strain has an extremely high tolerance towards multiple organic acids identified by DOE as platform chemicals. In addition, we determined the draft genome sequence of SD108 via 454 de novo sequencing, offering a resource not only for gaining further insights into the properties of this organism, but also for designing strategies to alter its metabolism for production of chemicals. As proof of concept, four genes from the reductive TCA pathway were assembled and integrated to the genome of a uracil auxotroph strain of I. orientalis SD108. The resulting strain exhibited significantly improved titer, yield and productivity of succinic acid production. These results suggest SD108 is a promising host for industrial production of organic acids. The basic features of I. orientalis SD108 as a potential platform organism were first investigated. Batch cultures using shake flasks were performed at 30°C in synthetic complete (SC) medium under oxygen-limited condition. I. orientalis SD108 can ferment fructose as efficiently as glucose (Figure1 and Additional file 1: Figure S1). The maximal specific growth rates of SD108 on 5 g/L of glucose and 5 g/L of fructose were 0.62h−1 and 0.65h−1 respectively (Additional file 1: Figure S1). Shake flask culture profiles of SD108 were further determined using 50 g/L glucose and 50 g/L fructose as carbon source, respectively. As shown in Figure1A, SD108 was able to consume all the glucose within 24h. The titer of glycerol was below 2 g/L. Acetic acid was not detected during most of the shake flask culture, except for 0.36 g/L at 24h. An ethanol yield of 0.31 g/g glucose was achieved after 24h. With fructose as the sole carbon source, the shake flask culture profile was similar to that with glucose. An ethanol yield of 0.24 g/g fructose was achieved after 24h, which was 23% less than that of glucose (Figure1A and B). In addition to glucose and fructose, other sugar components found in different types of biomass substrates including xylose, arabinose, cellobiose, galactose and sucrose - were tested as potential carbon sources. No consumption of these sugars was observed both at low (5 g/L) and high (50 g/L) concentrations. Characterization of sugar utilization in I. orientalis SD108. (A) Batch cultures using shake flasks profile of SD108 in SC medium containing 50 g/L of glucose. (B) Batch cultures using shake flasks profile of SD108 in SC medium containing 50 g/L of fructose. The pH range and optimum pH for growth of strain SD108 were first examined from pH 0 to 6 using 50 g/L of glucose as carbon source. 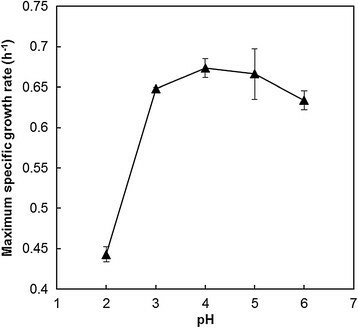 While it did not exhibit growth at pH 0 and 1, a wide optimum pH range of this strain was observed between pH 3 and 6, with a maximum specific growth rate of 0.67h−1 (Figure2 and Additional file 1: Figure S2). Given that the pKa values for most building block organic acids range from 3 to 5, the pH of a fermentation culture is expected to decrease to around 2.0 for acid titers of 50 g/L. The resultant acidity would possibly have little effect on cell growth of this strain. Maximum specific growth rates of I. orientalis SD108 in SC medium at different starting pH values. To evaluate the organic acid tolerance of SD108, four organic acids were selected: succinic acid, itaconic acid, adipic acid, and acetic acid. Cell growth of SD108 in the presence of different concentrations of these organic acids was analyzed. To eliminate initial pH discrepancies between these organic acids, all the starting pH values were adjusted to 5.6, which is in the optimal pH range of this strain (Figure2). As shown in Figure3, the OD600 values of SD108 after 10h were greater than the initial value of 0.2 under all the tested conditions. 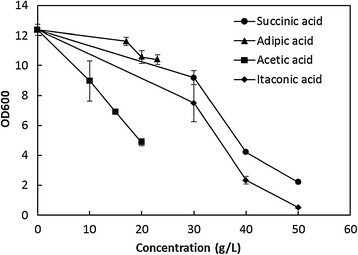 Finally, 30 g/L of succinic acid, 30 g/L of itaconic acid, 23 g/L of adipic acid and 20 g/L of acetic acid, under which concentrations SD108 exhibited clear growth, were selected for further analysis (Figure3). Cell growth of I. orientalis SD108 after 10h in SC medium containing various organic acids. All the initial pH values were 5.6. In order to gauge the organic acid tolerance performance of SD108, another strain of I. orientalis, I. orientalis ATCC 24210, and a fast-growing industrial yeast, Classic Distiller’s Turbo yeast, were chosen for comparison. Classic Distiller’s Turbo yeast exhibits higher tolerance towards multiple alcohols and inhibitors contained in lignocellulose hydrolysates (e.g., ethanol, n-butanol and furfural) than a series of Saccharomyces cerevisiae laboratory strains including S. cerevisiae W303a, S. cerevisiae BY4741 and S. cerevisiae CEN.PK 113-7D (data not shown). No significant difference in the lag phase was found among these three strains in the presence of various organic acids, although the lag phase of the strains in the presence of 30 g/L of succinic acid or 30 g/L of itaconic acid was 6hours longer than those observed in 23 g/L of adipic acid or 20 g/L of acetic acid (Figure4). As shown in Table1, the maximum specific growth rates of both I. orientalis ATCC 24210 and SD108 were 0.65h−1 in the cultures without any supplemented organic acid, which are 12% higher than Classic Distiller’s Turbo yeast. SD108 exhibited maximum specific growth rates of 0.37, 0.43, 0.58 and 0.55h−1 in the cultures with 30 g/L of succinic acid, 30 g/L of itaconic acid, 23 g/L of adipic acid and 20 g/L of acetic acid, respectively. These rates were 68%, 65%, 12% and 25% higher than Classic Distiller’s Turbo yeast under such conditions. It was noted that strain SD108 exhibits significantly improved tolerance over strain I. orientalis ATCC 24210 in the presence of 30 g/L itaconic acid, 23 g/L adipic acid and 20 g/L acetic acid, where the maximum specific growth rates of SD108 were 16%, 5% and 10% higher than those of I. orientalis ATCC 24210, respectively (Table1). Cell growth of the strains in SC medium containing different organic acids. All the initial pH values were 5.6. SD 108, I. orientalis SD 108; ATCC24210, I. orientalis ATCC 24210; CTY, Classic Distiller‘s Turbo Yeast; w/o, without any organic acid added. (A) 30 g/L of succinic acid; (B) 30 g/L of itaconic acid; (C) 23 g/L of adipic acid; (D) 20 g/L of acetic acid. All the initial pH values were 5.6.
aThe maximum specific growth rate of strain I. orientalis SD108 was statistically significant over that of strain Classic Distiller’s Turbo Yeast (P−<−0.05) as determined by the Student t-test; bThe maximum specific growth rate of strain I. orientalis SD108 was statistically significant over that of strain I. orientalis ATCC 24210 (P−<−0.05) as determined by the Student t-test. The above features emphasize the biotechnological potential of I. orientalis and reinforce a need for developing genetic manipulation tools for this strain. The availability of genome sequence of SD108 becomes important, which may serve as the molecular basis for designing genetic and metabolic engineering strategies. A draft genome sequence was established by whole-genome-shotgun and paired-end sequencing using the Genome Sequencer FLX−+−system and subsequent data assembly using the GS De Novo Assembler version 2.6 from 454 Life Sciences. There are 5,093 predicted genes, more than 85% of which have homologs in Pichia stipitis and S. cerevisiae. A schematic of predicted genes in I. orientalis SD108, related to carbohydrates utilization, glycolysis, pentose phosphate pathway, pyruvate metabolism, TCA cycle and glyoxylate shunt pathway, is shown in Additional file 1: Figure S3. In addition, relying on chromosomal DNA staining and flow cytometry , SD108 was determined as a diploid strain. More details about genome sequencing and ploidy determination are shown in supplementary materials. We first sought to generate a uracil auxotroph strain as a recipient strain for future genetic manipulation with uracil auxotrophy as selection marker. The regions flanking the ura3 open reading frame were separated amplified and spliced via overlap extension PCR as a deletion fragment. After transforming 5 μg of this deletion fragment into SD108, transformants were spread on SC−+−FOA plates. After incubation at 30°C for at least one week, twenty colonies appeared on the SC−+−FOA plate and each colony was restreaked on a SC-URA plate and a new SC−+−FOA plate in parallel. Eight of the twenty candidates could only grow on the SC−+−FOA plate (Additional file 1: Figure S5A) and PCR analysis of their isolated genomic DNAs confirmed the loss of both copies of ura3. Transforming these strains with a wild type ura3 gene, yielding strain Io−ura3−+−ura3, could complement the loss of ura3 function (Additional file 1: Figure S5B). As expected, only one locus was repaired, which was confirmed by PCR analysis (Additional file 1: Figure S5C). As the next step to test whether SD108 could be a promising host for producing organic acids, we chose to work on the biosynthesis of succinic acid. 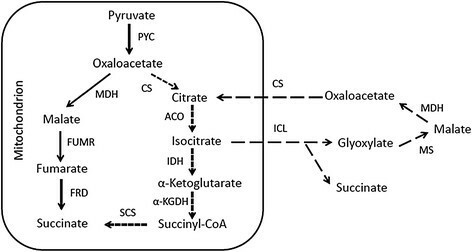 The reductive TCA cycle, oxidative TCA cycle and glyoxylate shunt pathway are the three primary fermentation pathways for producing succinic acid (Figure5), among which the reductive TCA cycle gives the highest theoretical yield on glucose (1.31 g/g) . Based on the reductive TCA cycle, genes pyc, mdh, fumr and frd, encoding pyruvate carboxylase, malate dehydrogenase, fumarase and fumarate reductase, respectively, are the most important targets for applying metabolic engineering strategies to improve succinic acid production ,. In addition, to avoid the potential issue with succinic acid being exported across the inner membranes (e.g., from mitochondria to cytoplasm), enzymes that are likely expressed in the cytoplasm became our first choice. According to the genome annotation, gene JL09 _g1614 and JL09 _g1983 are predicted to be the pyc and fumr genes, respectively. Three types of malate dehydrogenase - mitochondrial malate dehydrogenase, cytoplasmic malate dehydrogenase, and peroxisomal malate dehydrogenase - are found in yeast, which are named as MDH1, MDH2 and MDH3, respectively . Genes JL09 _g238, JL09 _g1975 and JL09 _g4199 are predicted as mdh. According to the amino acid identities with MDHs in S. cerevisiae S288c, all of the predicted MDHs share amino acid identities (0.37−~−0.42) similar to MDH2 in S. cerevisiae S288c. Therefore, gene JL09 _g4199 was arbitrarily chosen as mdh. In addition, since none of the genes was identified as frd in the sequenced genome, we decided to test the previously reported codon-optimized FRD in S. cerevisiae (Table2). To ensure that all these enzymes would be co-expressed in the cytoplasm, potential signal peptides were removed (C-terminal PKL of MDH, N-terminal 15 amino acids of FUMR, and C-terminal SKI of FRD) according to the sequence information . Three fermentation pathways for succinate production. The reductive TCA, oxidative TCA and glyoxylate shunt pathway were shown by solid, short dashed and long dashed arrows respectively. PYC, pyruvate carboxylase; MDH, malate dehydrogenase; FUMR, fumarase; FRD, fumarate reductase; CS, citrate synthase; ACO, aconitase; IDH, isocitrate dehydrogenase; −-KGDH, −-ketoglutarate; SCS, succinyl coenzyme A synthetase; ICL, isocitrate lyase; MS, malate synthase. With gene ble, encoding the zeocin resistance gene, under the control of Saccharomyces cerevisiae TEF1 promoter. Derived from pPK2, with C. parapsilosis ARS7 ORI deleted. In order to obtain high transcription levels, the pyc, mdh, fumr and frd genes were individually cloned to downstream of strong promoters fba1p, tef1ap, pgk1p and tdh3p, respectively. These promoters were chosen due to the relatively high transcription levels of the corresponding native genes under our cultivation conditions determined via real-time PCR analysis (Figure6A). When SC-URA medium containing 50 g/L glucose and 25.52 g/L calcium carbonate was used as the shake flask culture broth, the final engineered strain Io−ura3−+−SA consumed 49.72− −0.01 g/L glucose and produced 2.61− −0.29 g/L of succinic acid within 24h, while strain Io−ura3−+−ura3 consumed 49.71− −0.01 g/L glucose and only produced 0.37− −0.01 g/L of succinic acid under the same condition. The enhancement of the transcriptional levels of pyc, mdh, fumr and frd was further confirmed in strain Io−ura3−+−SA (Figure6B). Transcritional profiles of the succinic acid pathway, gene alg9 was used as the internal control. (A) Transcriptional levels of the succinic acid pathway at 24h in strain Io−ura3−+−ura3. Shake flask culture experiments were carried out in the SC-URA medium containing 50 g/L glucose; (B) Transcriptional levels of genes pyc, mdh, fumr and frd at 48h in the Io−ura3−+−ura3 and Io−ura3−+−SA strains. Shake flask culture experiments were carried out in the SC-URA medium containing 50 g/L glucose and 25.52 g/L calcium carbonate. To further compare the shake flask culture characteristics, Io−ura3−+−SA strains were tested in SC-URA medium containing 100 g/L glucose and 25.52 g/L calcium carbonate. No significant differences were found in glucose consumption, growth and ethanol production between strain Io−ura3−+−SA and strain Io−ura3−+−ura3 over the entire shake flask culture course (Figure7A, B and D). Strain Io−ura3−+−SA was able to consume all glucose and produce 11.63− −1.38 g/L succinic acid at 110h, whereas strain Io−ura3−+−ura3 consumed 99.29− −0.08 g/L glucose and yielded 1.43− −0.04 g/L succinic acid during the same period (Figure7B). Because of the neutralization by calcium carbonate, the final pH of strain Io−ura3−+−SA was only 1.78 units lower than that of strain Io−ura3−+−ura3 (5.08− −0.12 vs. 6.86− −0.74). Notably, the glycerol produced by strain Io−ura3−+−SA was much lower than strain Io−ura3−+−ura3 (Figure7C), which may be attributed to the amount of NADH needed by the reductive TCA cycle ,,. In addition, the acetic acid produced by strain Io−ura3−+−SA was also lower than that of strain Io−ura3−+−ura3 (Figure7C). Although formation of acetic acid may be due to the regeneration of reducing equivalents, the substrate oxaloacetate required by the reductive TCA cycle may become a driving force for directing pyruvate into oxaloacetate instead of acetic acid . As a result, the succinic acid titer, yield on glucose, and productivity of strain Io−ura3−+−SA (11.63 g/L, 0.12 g/g and 0.11 g/L . h) were much higher than those of strain Io−ura3−+−ura3 (1.43 g/L, 0.01 g/g and 0.01 g/L . h). Growth and metabolite profiles in batch culture using shake flasks of strain Io−ura3 −+−ura3 and strain Io−ura3 −+−SA in the SC- URA medium containing 100g/ L glucose. (A) Sugar consumption; (B) Succinic acid and ethanol concentration; (C) Acetic acid and glycerol concentration; (D) Cell growth. Product toxicity is a lingering problem in developing economical fermentative processes for production of organic acids despite decades of research. In addition, economically viable biorefinery operations require the use of cheap substrates such as lignocellulosic hydrolysates. This necessitates the use of strains with two properties: first, the ability to utilize various biomass sugars, and second, the ability to tolerate inhibitors contained in lignocellulosic hydrolysates. Although SD108 cannot intrinsically utilize many sugars released from lignocellulosic hydrolysates, it should be feasible to introduce the sugar utilization pathways from related species (e.g. Pichia kudriavzevii M12 ) into this strain, similar to strategies which have been successfully applied in S. cerevisiae . Moreover, various by-products, mainly organic acids, are inevitably generated during hydrolysis and exert negative effects on the host . In these scenarios, platform organisms which tolerate multiple organic acids have an obvious advantage as they can utilize hydrolysates more robustly. The high tolerance of I. orientalis SD108 towards multiple important organic acids makes it a highly attractive platform host for producing this group of compounds. In addition, the doubling time of SD108 was 11% shorter than the fast growing yeast, Classic Distiller’s Turbo Yeast (1.06h vs. 1.19h) (Table1 and Figure4). This means that more cells of SD108 are available during the same time period, and thus the high productivity desired in industrial processes may be achieved more easily. For such a potential platform organism, the availability of its genome sequence is essential. It will offer further insights into its properties, and more importantly, facilitate the genetic and metabolic engineering studies. The molecular mechanisms underlying the ability of I. orientalis to resist the lethal effects of a spectrum of organic acids have not been identified. Normally, acid stress will induce complex transcriptional responses and intricate processes that relate to a set of genes. Hence genome-wide analysis of the transcriptome and proteome are usually needed to identify the genes involved in stress response ,. Known tolerance mechanisms used by S. cerevisiae and E. coli to cope with acidic environments include, but are not limited to, inducing expression of stress genes, changing membrane composition, transporting protons out of the cell, and consuming protons via decarboxylation reactions , . By comparison of previously identified determinants of acid tolerance, candidate genes related to acid tolerance in I. orientalis SD108 are summarized in Additional file 1: Table S5. Our draft genome sequence offers a basis for designing further functional genomics studies to investigate the mechanisms underlying acid tolerance. Succinic acid production is a specific example of exploiting genome information to rewire metabolic pathways. By integration of endogenous genes pyc, mdh, fumr and an exogenous gene frd driven by endogenous strong promoters, the resultant strain exhibited significant improvement of the titer, yield and productivity (Figure7). The reductive TCA cycle is the most interesting pathway for succinic acid production. While it provides the highest succinic acid yield on glucose as compared with the other two pathways, the net deficit in reducing power (NADH) poses a challenge for metabolic engineering . Strategies to address the redox imbalance include either combining the oxidative TCA and/or glyoxylate shunt pathways with the reductive TCA cycle, supplying NADH and direct carbon flux into succinic acid, or introducing other pathways for NADH supply (e.g., glucose-6-phosphate dehydrogenase) ,. In addition, blocking byproduct production (e.g., glycerol, ethanol and acetate) and deletion of the reverse reactions of the reductive TCA cycle (e.g., from succinate to fumarate, which is catalyzed by succinate dehydrogenase) should also be considered in future plans. In addition to chromosomal integration, an episomal plasmid based expression system is desirable in a potential platform organism. Neither 2 μ nor CEN ARS sequences, which are commonly used as the origin of replication in S. cerevisiae, could be maintained in SD108. We were able to successfully identify a functional ARS from the digested genomic DNA of SD108 (Additional file 1: Figure S6). The plasmid containing this 91 bp sequence could express zeocin resistance marker and can be maintained throughout the cultivation process, providing another viable option to express the target pathway in this host. We are currently determining the copy number of such an ARS and testing the succinic acid production if the associated genes are expressed on an episomal plasmid. In addition, SD108 is diploid, which makes gene deletion inconvenient. The plasmid-based expression in SD108 should facilitate the deployment of recently developed powerful genome editing tools (e.g., TALEN and CRISPR)  , which may delete multiple copies of one gene or different genes simultaneously. The organic acid biorefinery industry demands a better “Microbial factory” that exhibits an excellent tolerance to moderately low pH and high product titer conditions, and can grow and produce the target organic acid at high rates. I. orientalis SD108 indeed demonstrates an exceptional tolerance towards multiple industrially important organic acids. Our biochemical and genetic characterization provides a resource to identify novel candidate genes coding for proteins involved in acid tolerance and offers a basis to design future strategies to evaluate its metabolic capabilities and biotechnologically important features. Based on the genome information, genetic tools for SD108 have been developed and metabolic engineering strategies have successfully been applied for increasing succinic acid production, which further makes this strain more attractive. The strains and plasmids used in this study are listed in Table2. Cells were grown in liquid SC , SC-URA or SC-LEU medium supplemented with various sugars as the carbon source or on solid YPAD medium (1% yeast extract, 2% peptone, 0.01% adenine hemisulfate, 2% glucose and 2% agar) unless otherwise noted. The initial pH value of SC culture was adjusted to 5.6 using 12M NaOH, and was not controlled during shake flask culture. For isolation and identification of SD108, see Additional file 1: Supplementary data for details. For calculating maximum specific growth rates of I. orientalis SD108 at different starting pH values, stationary-phase cells grown in SC medium  were transferred into 5 mL of SC medium containing 50 g/L glucose in a 15 mL round-bottom Falcon tube (30°C, 250 rpm). The initial pH values were adjusted to 0, 1, 2, 3, 4, 5 or 6 by using 12M HCl or 12M NaOH, citric acid-sodium citrate buffer solutions were used to maintain the pH (http://www.sigmaaldrich.com/life-science/core-bioreagents/biological-buffers/learning-center/buffer-reference-center.html) (Additional file 1: Figure S2). To determine cell growth of I. orientalis SD108 in SC medium containing various organic acids, stationary-phase cells grown in SC medium were transferred into 5 mL of SC medium containing 50 g/L glucose and various concentrations of organic acids in a 15 mL round-bottom Falcon tube (30°C, 250 rpm). Cell densities after 10hours of growth were measured. For the organic acid tolerance assay, stationary-phase cells grown in SC medium containing 50 g/L glucose were transferred into 20 mL of fresh SC medium containing 50 g/L glucose and various organic acids at appropriate concentrations in 125 mL non-baffled shake flasks. Cells were grown under oxygen-limited conditions as described previously (30°C, 100 rpm) . The initial OD600 for various tolerance assays were 0.2. The initial pH values were adjusted to 5.6 using 12M NaOH except as described elsewhere. DNA transformation of SD108 and its derived strains was carried out using the method developed by Gietz and Schiestl . See Additional file 1: Supplementary data for details. Genomic DNA from I. orientalis SD108 was isolated with the Wizard Genomic DNA Purification Kit (Promega, Madison, WI). An upstream homology arm of 543 bp and a downstream homology arm of 279 bp were PCR-amplified separately from the genomic DNA using primers Ura-p-up/Ura-p-dn and Ura-t-up/Ura-t-dn, respectively (Additional file 1: Table S1). These arms were spliced into a ura3 deletion fragment via overlap extension PCR . A total of 5 −g of the ura3 deletion fragment was used to delete both copies of ura3 simultaneously. DNA transformation was carried out with the time for heat shock being 90Min. Transformants were spread on SC−+−FOA plates and incubated at 30°C for approximately 10 days. Transformation protocol was further optimized using the uracil auxotroph SD108 strain as a starting strain. See Additional file 1: Supplementary data for details. Pathway construction was carried out using the DNA assembler method . See Additional file 1: Supplementary data for details. Samples for qPCR were collected from 20 mL of SC-URA medium containing 50 g/L glucose or 50 g/L glucose plus 25.52 g/L calcium carbonate. RNA preparation, generation of cDNA and real-time PCR analysis were performed as described previously . The alg9 gene was used as an internal control, commonly used as the internal control for transcriptional analysis in S. cerevisiae. The qPCR primers are listed in Additional file 1: Table S1. Batch cultures using shake flasks were carried out as follows: a single colony grown on SC-URA plate was inoculated into 3 mL of SC-URA medium containing 2% glucose in a 15 mL round-bottom Falcon tube and grown until saturation (30°C, 250 rpm). About 100 μL of the stationary-phase cells were transferred into 20 mL of fresh SC-URA media containing 25.52 g/L calcium carbonate and different concentrations of glucose in 125 mL non-baffled shake flasks. Cells were grown under oxygen-limited conditions (30°C, 100 rpm). The initial OD600 was 0.2. The samples were centrifuged and the supernatants were diluted 0 to 10 times before HPLC analysis. An HPLC system equipped with a refractive index detector (Shimadzu Scientific Instruments, Columbia, MD) was used to analyze the concentrations of glucose, xylose, arabinose, cellobiose, galactose, sucrose, fructose, ethanol, acetic acid, glycerol and succinic acid in the broth. To separate all the metabolites mentioned above, an HPX-87H column (BioRad, Hercules, CA) was used as described previously . The HPLC chromatogram was analyzed using the LCsolution software (Shimadzu Scientific Instruments, Columbia, MD). The characterization, tolerance assay and metabolic engineering of succinic acid producing I. orientalis SD108 strain were performed by HX and ZS. Genome size and ploidity were estimated by YJ. Genome was sequenced and analyzed by HX, ZS, YJ, High-Performance Biological Computing and the DNA sequencing facility at University of Illinois. Strain SD108 was isolated, identified and initial low pH and organic acid tolerance was done by SD. All authors contributed to the writing and have approved the final manuscript. Dr. Zengyi Shao: Assistant professor, Department of Chemical and Biomolecular Engineering, 4140 Biorenewables Research Laboratory, Iowa State University, Ames, IA 50011; Dr. Yu Jiang: Associate Professor, Fenglin Road #300, Institute of Plant Physiology and Ecology, Shanghai Institutes for Biological Sciences, Chinese Academy of Science. Dr. Sudhanshu Dole: Senior scientist, Molecular Biology Department, Myriant Corporation, 66 Cummings Park, Woburn, MA 01801. The project was funded by Myriant Corporation. We thank the High-Performance Biological Computing and DNA sequencing facility at the University of Illinois for genome sequencing, annotation and release, ARS Culture Collection (NRRL) for offering strain I. orientalis ATCC 24210, Dr. Peter Orlean (Department of Microbiology, University of Illinois at Urbana-Champaign, Urbana, USA) for offering strain S. cerevisiae PRT238, Dr. William Metcalf (Department of Molecular and Cellular Biology, University of Illinois at Urbana-Champaign, Urbana, USA) for offering strain E.coli BW25141, Dr. Jozef Nosek (Department of Biochemistry and Genetics, Comenius University, Bratislava, Slovak Republic) for offering plasmid pPK2, Dr. Giek Far Chan (School of Applied Science, Temasek Polytechnic, Singapore) for providing genome information of Pichia kudriavzevii M12, Mr. Ryan E. Cobb, Mr. Jing Liang (Department of Chemical and Biomolecular Engineering, University of Illinois at Urbana-Champaign, Urbana, USA) and Dr. Zihe Liu (Metabolic Engineering Research Laboratory, Institute of Chemical and Engineering Science, Agency for Science, Technology and Research, Singapore) for helpful suggestions and thoughtful discussions.